It only works reliable if you sort the CKAN file so that dependencies are always installed before the mod that requires them. - In case the fav pack we talked about above doesn't work for you this one won't be better for you. - Updating from older Mods using this CKAN file is tricky. Uninstall every mod that has an update available in CKAN first, then try to use the package. Scatterer refused to be installed using the list. A single craft base like that one still has exploding problems? Ouch. Lessen the effects of physics glitches and get back to designing rockets to handle flight, not to handle the forces applied when the game loads. That's a good idea. I've used KJR before and found it to be pretty good. 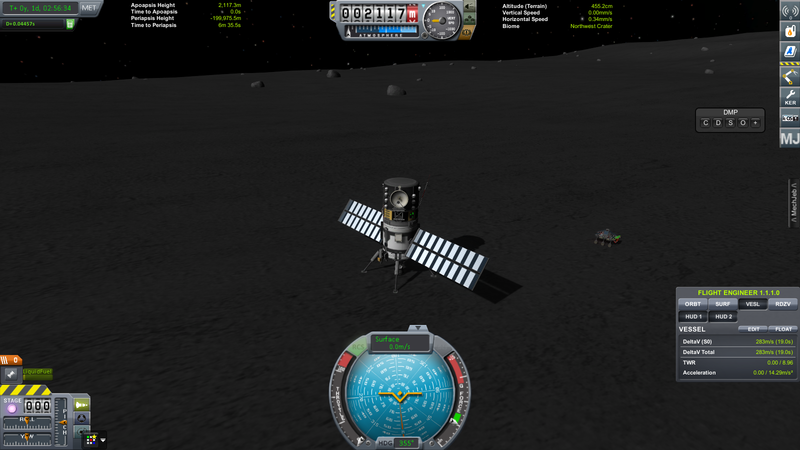 I think I left a lander in orbit on minmus, so I'll go and test that now. This is my first trip out to the new planets - Sarnus is the nearest one and it's so far away I don't have a comm connection back to kerbin with those big dishes! There's a Kerbal on board, so anything which goes to Sarnus will be controlled by him, so long as you point your dishes to Sarnus Orbital Command. Now all that is left to do is to convince Martin to add it to the server white-list. 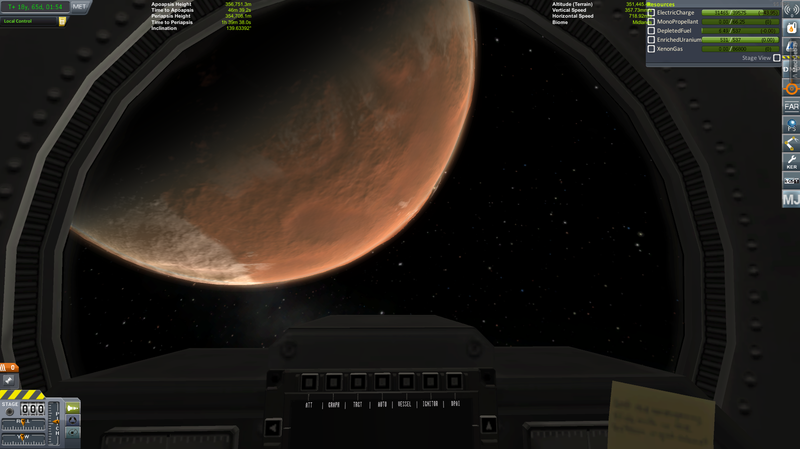 And the KSP forums thread, if anyone is interested. @martindevans, just noticed that the lights, gears and breaks switches do not work, also items in KIS inventory are not stackable, not sure what is causing the problem. Also thanks for adding the KerbalBrain part to the non-blacklist. 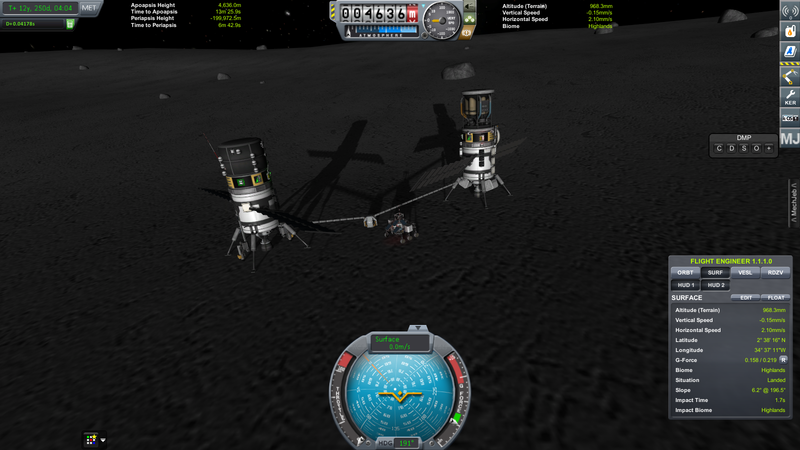 Wow, had forgotten about Kerbal - not played it in a few years. Will have to dust it off...though the initial accidents were always a little tough (Kerbal face in view looking so happy then... oh noes ). 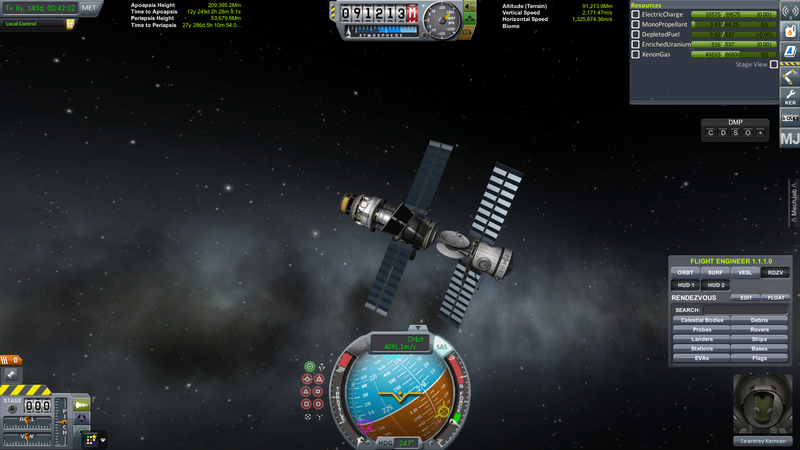 Enjoy the Ion burn that lasts like 10min, also the reactor needs to be at around 14% to sustain it. Started making a base on the Mun, so far it has a ore miner and a fuel processor, also my mod seems to be working just fine. 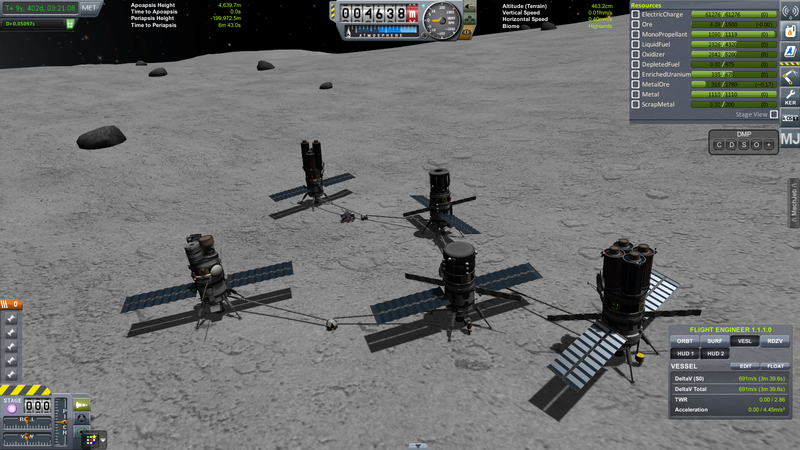 Quick update on the Mun base, it now has a Ore Miner, Fuel Processor, Nuclear Reactor, MetalOre Miner and Smelter modules, still needs a workshop and a launchpad. Martin, any suggestions on how to land that launchpad in a elegant manner? This looks fun. Anyone know if the server is still up and active? I think I chose a really bad time to start the KSP multiplayer up again - it was just after the huge 1.1 release and I ended up being overwhelmed by a torrent of mod problems (possibly due to CKAN misbehaving, possibly due to my ineptitude at composing CKAN files). I'm doing a career run through on Real Solar System at the moment, so I'll probably put up the server in a couple of months after I'm done with that (unless anyone wants an RSS KSP server, that actually sounds pretty cool to me). All good. But if that time comes around do let us know. Last time I tried DMP was at least a year ago, maybe 18 months. It was quite jerky, particularly in atmospheric flight. Has the netcode or user experience improved at all? I've not followed DMP closely but it's probably still just as jerky in atmosphere (only when watching someone else, your own plane should be totally smooth). Navy that is your mod??? I never made the connection. Duh. It's always one of the first I download. Can't play without it so thank you for putting in the work to make something so useful! Shouldn't you post this on the ksp forum, not the Inovaestudios forum? It is indeed. You're welcome! I'm surprised squad hasn't made something similar stock yet, to be honest. Why do you say that? This is a thread about ksp, tagged as general. I have been a member of the inovae forums since 2006 (back when the domain was fl-tw), have formed many relationships with folks here, and would like to play a game of MP KSP with them. It seems like exactly the right place to post this. So it looks like each client sends their full state to the server, which assumedly just forwards it naively to all other relevant clients. Makes sense since this server isn't a ksp instance and therefore doesn't have much insight into the spatial relationship between players. That eliminates a lot of possible interpolation solutions, but it seems that a client side receive buffer could fit into their current code. I'll have to dig deeper to see if they frame stamp or timestamp packets, but at the expense of latency, jitter caused by changing network conditions could be drastically reduced. Interestingly, due to the trusted client architecture, two buffers would actually be required. One on the server to smooth out received client state updates, and then one on the client to smooth out received server forwarding updates.